Iridium GO! Hotspot with all standard components. 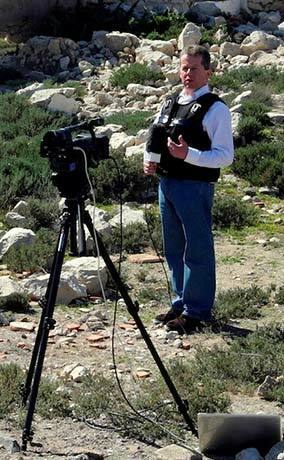 Outfitter Satellite stands behind all the equipment we sell. Our used Iridium GO! 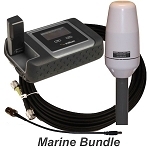 kit has been carefully tested and verified and includes a 6-month warranty. Outfitter Satellite also accepts trade-in of a wide variety of older satellite phone equipment towards the purchase of either new or used Iridium GO! hotspots. 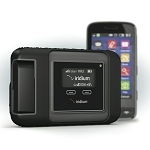 The Iridium GO!TM is a rugged Wi-Fi hotspot small enough to fit in your shirt pocket but powerful enough to enable your smartphone or tablet to make phone calls or send text messages over the global Iridium network. Up to 5 smartphones can be connected simultaneously. The Iridium GO! is light weight and portable. Mount it on the dashboard of your car. Stow it in your back pack. 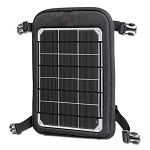 Outfitter Satellite also offers a USB solar charger option for your Iridium GO! and your smart device. First download the free Iridium GO! App for your iOS or Android device. This app lets you make phone calls, send and receive SMS messages, send automatic GPS tracking reports to friends, and if necessary send an emergency alert "SOS" notification. Just take the Iridium GO! outside and flip up its integrated Wi-Fi antenna. It will automatically power on and connect to the Iridium global network. You can make up to 7 hours of phone calls on a single charge. Up to 5 smart devices can connect wirelessly to the Iridium GO!, but only one can make phone calls at any given time. When an inbound call comes in, all the smart devices registered on the Iridium GO! will ring. Whoever answers the call can pass it to any of the other users if desired. Another free app, Mail & Web, is available for users wanting to send and receive emails, photo share, look at weather information, and upload posts to Twitter. ** Customers are advised that the data speed of the Iridium GO! is only 2400 bps (very slow). Customers using the Iridium GO! for light email activity will generally be satisfied, but sending emails with attachments larger than 100 KB can be difficult. Outfitter Satellite does not currently recommend the Iridium GO! for web browsing because of ongoing issues viewing websites with SSL security and certain iOS compatibility issues. The Iridium GO! can be a powerful safety tool. 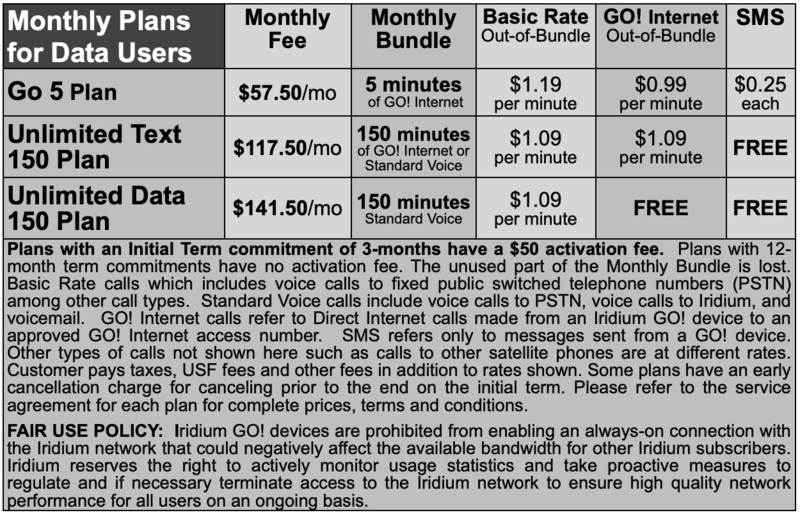 Simply use your Iridium GO! app to select a time interval for new position updates and identify the email address of the person that will be receiving them. The email reports contains your latitude, longitude, altitude and the time your position report was sent. A hyper link in the email report displays the position on a map (see right). The GPS tracking reports are billed as SMS (short message service) messages. 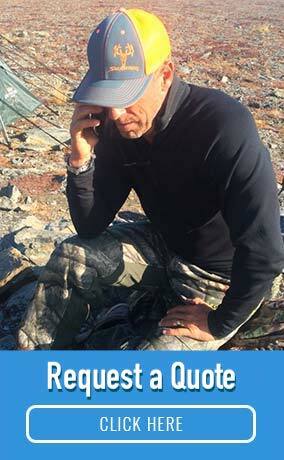 Outfitter Satellite offers both prepaid and postpaid plans. 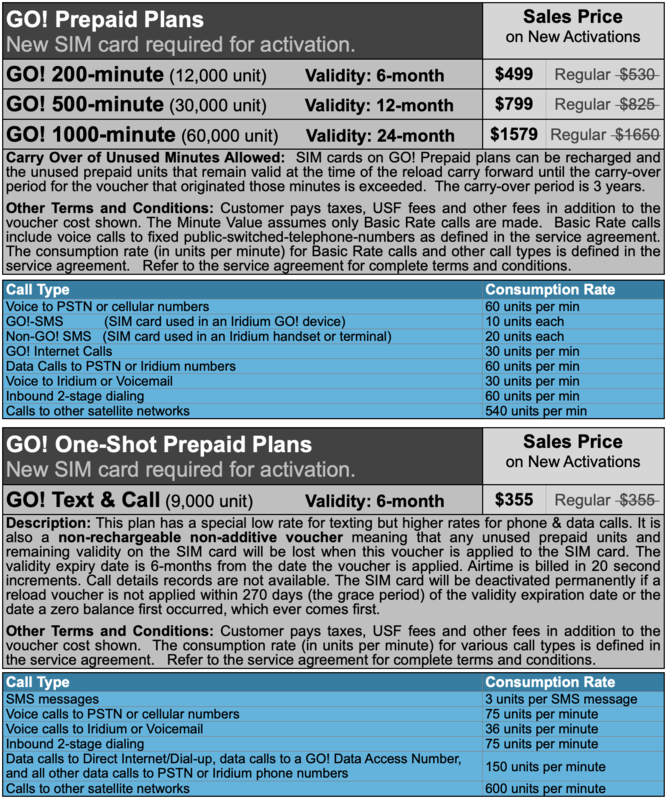 Select postpaid plans (starting at only $99 per month***) allow unlimited texting for a fixed monthly fee. Outfitter Satellite also offers economical web-based tracking services for a fixed monthly fee that would allow you to monitor a single vehicle or a fleet of vehicles using Iridium GO! anywhere on earth. If you have an emergency, a single button press will send an email alert that is tagged as an EMERGENCY and includes your GPS location. This can be done directly from the Iridium GO! without a smart device. An S.O.S. also can be sent using the Iridium GO! app on a smart device. An S.O.S. from the app can also start a voice call to an emergency number of your choice. How it works depends on how you configure it. You choose. 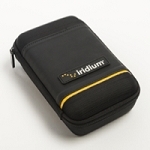 Global Emergency Response Services or GEOS is included with your Iridium GO! at no additional cost. This is a tremendous safety feature, especially for people traveling in remote areas of the world. Before using GEOS, you must register online and configure the S.O.S. button to contact GEOS during an emergency. * Iridium GO! 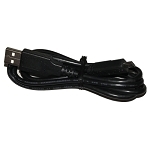 support for laptop computers, including Windows and Macintosh operating systems is not currently available. **The data rate of Iridium GO! is 2400 bps. It is not a broadband internet device. Only specialized internet applications, such as those offered through the Mail & Web app, can be expected to perform adequately via an Iridium GO! device. Outfitter Satellite has found that Iridium GO! is effective for light email activities when the Mail & Web app is used. Web browsing is not recommended by Outfitter Satellite. Broadband internet applications such as Skype and video conferencing are not supported. ***Prices on this page are only valid until our current inventory of used Iridium GO! is exhausted. Q: Will the Iridium GO work with the iridium next satellites? Is this a good choice for online we sites and email? Got the feeling that this was a very slow solution. Are there better ones? A: The current Iridium GO WILL work with the new constellation being launched. It's not a great choice for SITES. It does great with the provided app at emails. 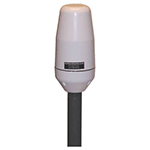 Depending on your needs and applications (use case) the BGAN products may be a better choice. The Iridium NEXT constellation is going to create more/better speeds for the Iridium equipment. We currently do not know if there will be an Iridium GO! (NEXT version) or the current one only. A: Hello. We actually do not ship internationally. We can ship to an international freight forwarder. You would have to pay by international wire transfer and there is an addition $100 fee for that. We would also need to custom quote that order for you since we could not process that order through the store. *IMPORTANT: The Iridium GO! is not a broadband internet device. It has a 2400 bps data speed which is suitable for light email applications performed using the Mail & Web app. Outfitter Satellite does not recommend the Iridium GO! for web browsing or heavy data use applications.